Here is my entry to the 2012 compo ! AnimEDS and its companion SEDS (Sprite Editor on NDS) allows you to create and animate pixel art graphics on your beloved little handheld device. 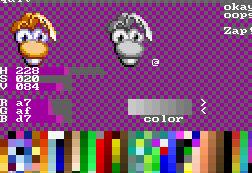 It features palette edition, pixel painting on 16x16 or 32x32 grids, storage and management into "sprite sheets" (64x192 pixels each) and "multi-limb animation" aka "modular animation" made popular by the original Rayman game. Created graphics and animations are fully compatible with the open-source "GEDS" game engine, but can also be exported to png format or animation instruction list for e.g. use in Web games. PS: more .SPR files will follow over the week for more fun. Make sure you copy SPRITEB.SPR and AUTOEXEC.SPR at the root of your media card, to have some bare graphics to start with. Loading that spriteset is achieved with [START]+[L]+(B). You can press [L+R] at any time to get online help. L-touch means "touch with the stylus while holding the [L] shoulder button. I've got one question. You said it can export to PNG or Animation instruction for web. Where does it export to? Can DS export onto the memory stick of the flash cart or something? # using my own 'runme' tool (although it's a bit crude) and the companion download/upload scripts. But then all you've got is a binary file holding dumps of the DS video RAM that my game engine uses natively. "export" is the process of converting that into some other format, like PNG. That happens on your PC computer, or using a web service. It's all described in the ".spr format" section of this user guide. There a google spreadsheet ready, waiting for your feedback. Oh, and if you push it far enough, you get a full game "Bilou: School Rush"
Hope you like the work on animation. Everything was done with AnimEDS and pixels were drawn on the Nintendo DS with SpriteEditorforDS. Level editor is of course on DS too. What else could I say. Oh, of course. the engine is open-source. I have a thread on how to use it on a gbatemp thread. 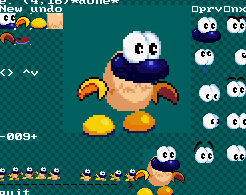 Note that if Bilou (the blue guy) makes a bounce that wasn't intended, you also get a free "double-jump" to convert the bounce into a regular jump. It helped some players before.